H&N Field Target Trophy 22 Caliber pellets have a great reputation for accuracy in many airguns. They are robust and the batch tested by HAM showed excellent consistency of head size. 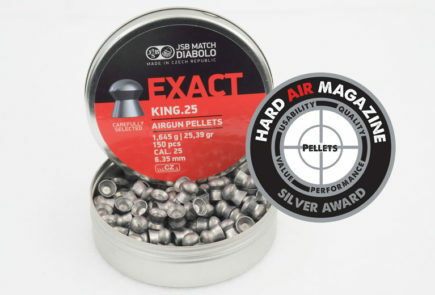 This is a great mid-range pellet for hunting and plinking. 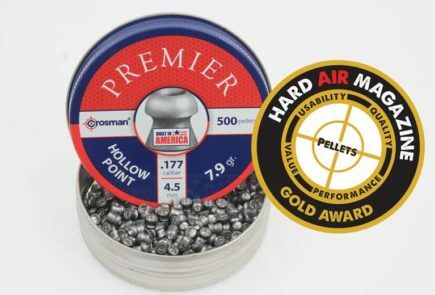 A coveted HAM Gold Award reflects the high quality of H&N Field Target Trophy 22 Caliber pellets for the price they sell at. 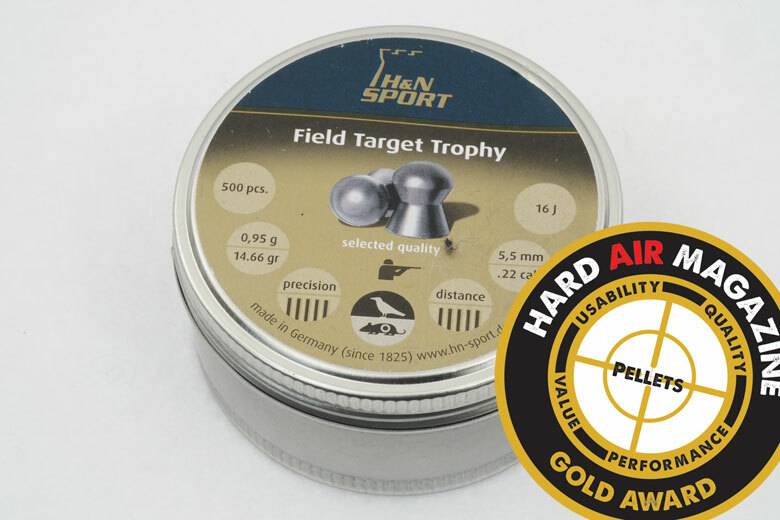 H&N Field Target Trophy 22 caliber pellets have a great reputation with many serious airgun shooters. That’s why we use them as one of the standard test pellets in our HAM airgun tests. 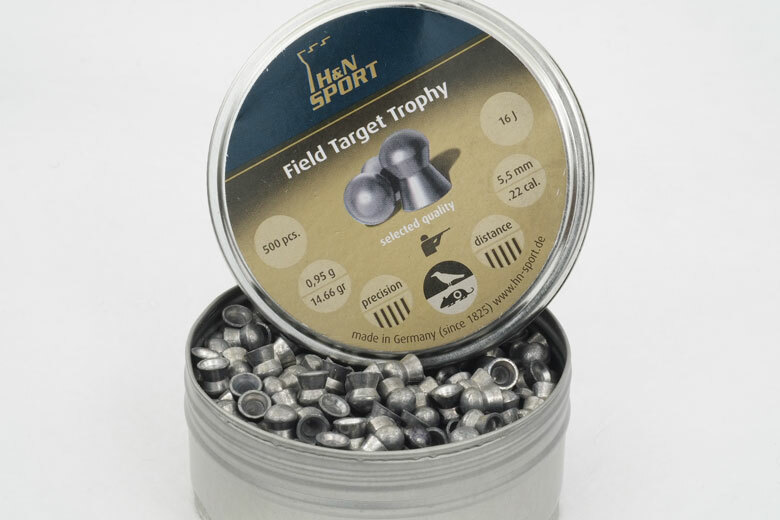 However when purchased in tins of 500 – as tested here – the H&N Field Target Trophy 22 caliber pellets are not at all expensive for a German-manufactured pellet with a quality reputation. 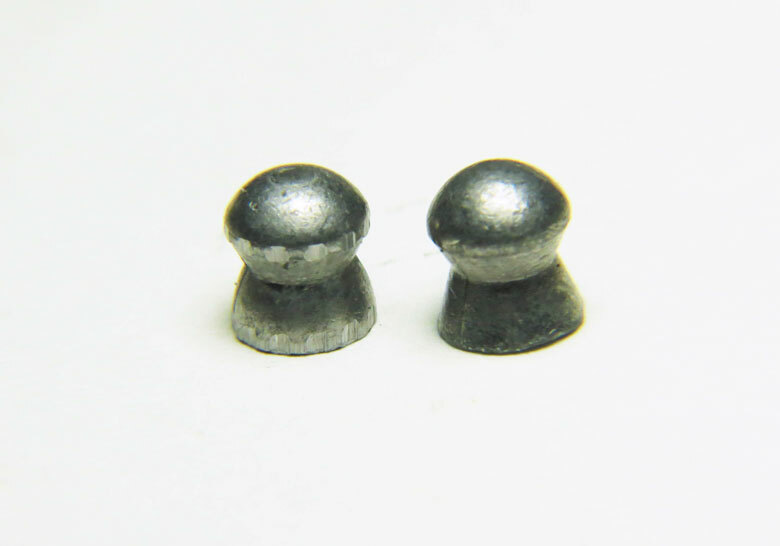 The price of 3.20 cents per pellet is significantly less than the median price for .22 caliber lead pellets. As always, you can find even lower prices from the leading online retailers if you buy four tins and get one free. The manufacturer claims that there are 500 pellets in the tin tested by HAM. In fact, there were 503. Thanks H&N! The H&N Field Target Trophy 22 caliber pellets have a weight specification of 14.66 Grains per pellet. The average weight of the sample tested by HAM and weighed on our laboratory-grade balance was exactly 15.00 Grains. That’s 2.3% greater than the claimed weight. Unusually, H&N specifies head diameters for many of its pellets. For the pellets tested by HAM, the claim is 5.53 mm, as we can see from the photograph below of the underside of the tin. In fact, the average head diameter of the H&N Field Target Trophy 22 caliber pellets tested by HAM was actually 5.55 mm. That’s 0.36% larger than the claim. A very small difference, but one nevertheless. H&N’s claims are that they are an extremely accurate competition pellet with flat trajectory at medium ranges. 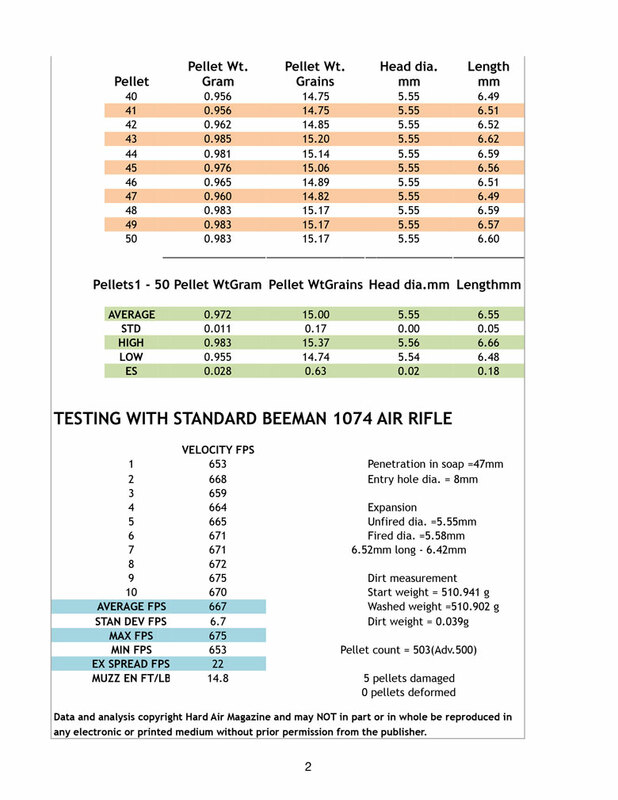 These claims are supported by the HAM-measured Ballistic Coefficient and Downrange Performance chart below. They also claim an exceptional aerodynamic design for high impact and penetration. Tightest shot groups are also claimed, as are the lowest rate of lead fouling due to the special alloy used in manufacture. HAM does not have a way to test these claims. 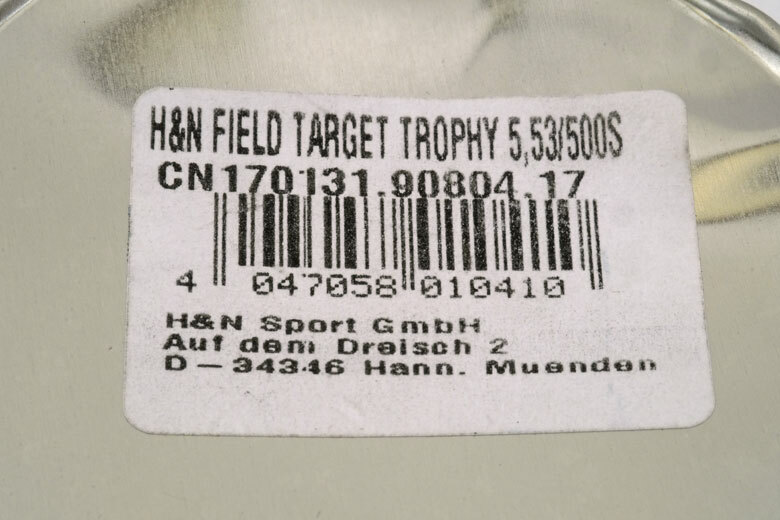 However, the high reputation of H&N Field Target Trophy 22 Caliber and their regularly excellent performance in HAM airgun testing support these claims. Although the tin of H&N Field Target Trophy 22 caliber pellets tested by HAM showed signs of external damage, no damaged pellets were found. 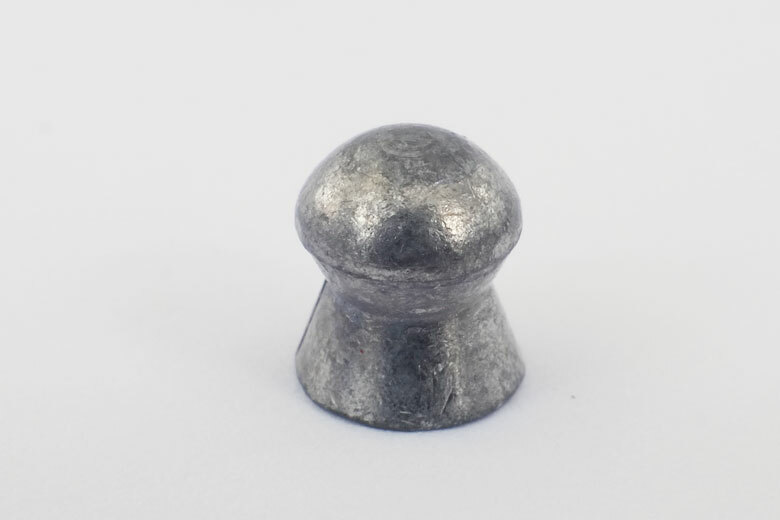 84% of the H&N Field Target Trophy 22 caliber pellets tested by HAM had a head diameter of 5.55mm. This is a high degree of consistency and well above average. Unfortunately, it’s consistent at a different diameter than the size marked on the tin! The difference between smallest and largest head diameters found was 0.36%. Again, this is a good figure and better than average found in HAM testing. Overall, head diameter is very well controlled. 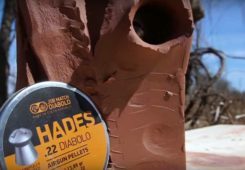 Surprisingly, the H&N Field Target Trophy 22 caliber pellets tested by HAM had fairly poor weight consistency. 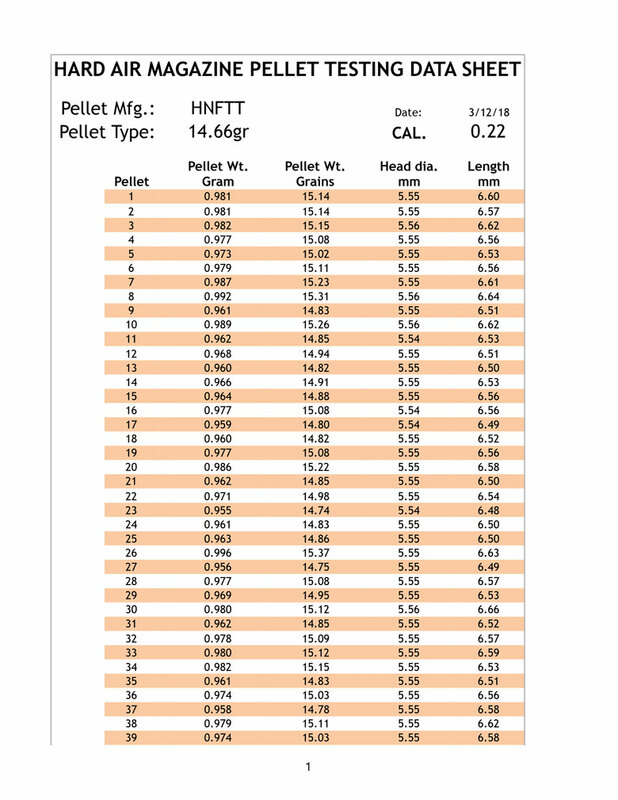 The most common pellet weights were 14.85 and 15.08 Grains. In both cases, just 8% of the tested pellets were of these weights. As we can see, all of the pellets were heavier than the claimed 14.66 Grain weight. The variation between the lightest and heaviest of the H&N Field Target Trophy 22 caliber pellets tested by HAM was 4.27%. The lightest weighed 14.74 Grains, while the heaviest was 15.37 Grains. This spread is larger than average. Length variation was also greater than average for the H&N Field Target Trophy 22 caliber pellets tested by HAM. 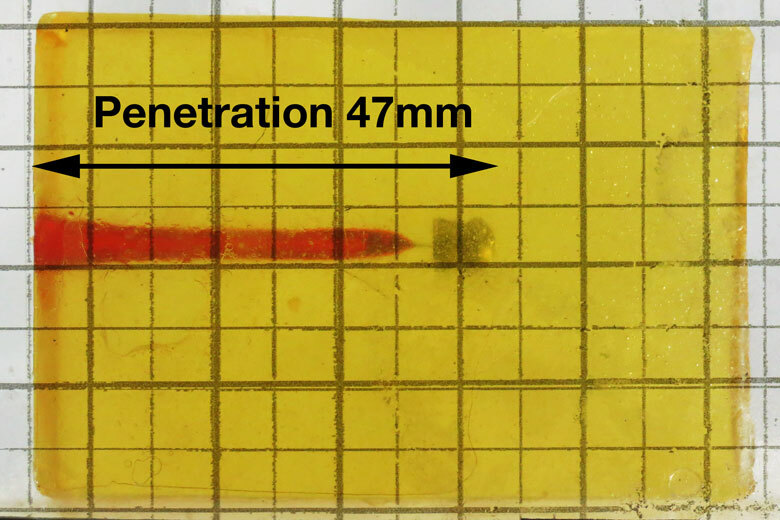 Although the average length was 6.55 mm, the shortest pellet measured 6.48 mm and the longest 6.66 mm. This a variation of 2.78% in length. The most common length was 6.56 mm. Just 14% of the tested pellets had this length – again surprisingly worse than average. As can be seen from the photograph below, the H&N Field Target Trophy 22 caliber pellets tested by HAM were certainly clean, however. A certain amount of lead dust and dirt is inherent in the manufacture of lead pellets. But the tin of pellets tested by HAM contained only a total of 0.6 Grains. For 200 pellets, that means an average of 0.12 Grains per 100 pellets. This is a very good performance! As usual, HAM used Chairgun software to analyze downrange performance. 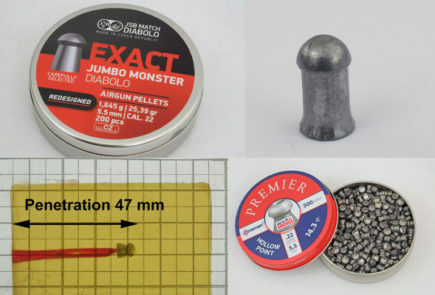 The Ballistic Coefficient for H&N Field Target Trophy 22 Caliber pellets of 0.019 measured by HAM is around the mid-point for domes of this caliber. It also matches the claim published by H&N themselves. This means that – even with our relatively low-powered Beeman 1074 test gun, these pellets shoot effectively “flat” from 9 to 33 Yards. It would be a longer spread with a more powerful air rifle, of course. Although the manufacturer lists H&N Field Target Trophy 22 Caliber as a “target” pellet, it can also perform usefully for hunting. As we saw from the Chairgun chart above, 70% or more of the pellet’s kinetic energy is maintained to 29 Yards. Combined with the demonstrated accuracy potential, that makes FTTs suitable for mid-range hunting. The H&N Field Target Trophy 22 Caliber pellet penetrated 47mm into the standard HAM soap block, with an entry hole of 8 mm diameter. 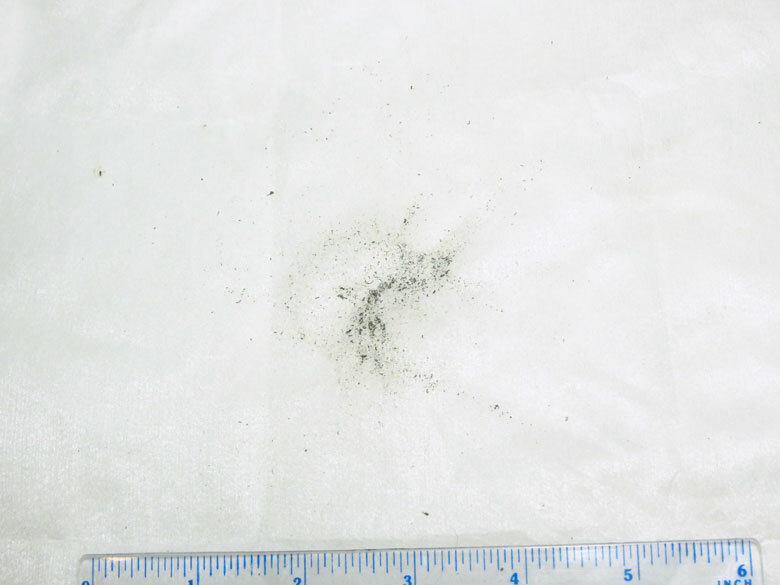 On retrieval from the soap, the pellet was found to have expanded out from 5.55 mm to 5.58 mm diameter. The length had shortened proportionately from 6.52 mm to 6.42 mm. Pronounced rifling marks are visible on the fired pellet, left, in the photograph below. H&N Field Target Trophy 22 Caliber pellets are widely available from all the major online retailers. As always, H&N’s screw-top tins are an useful and practical container for transport and storage. In spite of the test tin being visibly damaged, there were no damaged pellets inside the tin. That’s a good indication of the toughness of these pellets in everyday use.